Cedar Point was fun. I love rollercoasters. Ironically, I’m also scared of both heights and falling. And I am part-Houdini in the fact that no matter how tight people strap me down, I end up being able to wiggle out of the restraints. So while everyone else is waving their hands in the air, I am — as Damien points out — putting claw marks in the grab bar … and laughing. 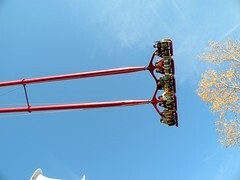 🙂 And I didn’t get a good reply to this in confession: if I am standing before some monstrosity of a fear-inducing ride that my friend are bent on torturing me with, is it taking the Lord’s name in vain to say “Oh Dear God!” when you follow that up with “Please help me not die on that thing!” and a few Hail Marys?? When thinking of my experiences with these rollercoasters, it always seems to follow the same formula. I look at one of them and am not sure about it. As I stand in line and contemplate it further, I get anxious and don’t think that I can handle it. I pray my way through this and end up making myself go despite my fear and try to trust that God would not allow me to be the one person to die at Cedar Point that day (despite the fact that I’ve always felt that I would die on some freak rollercoaster accident… LOL). Then, I end up having a lot of fun and realize that my fears were silly. (Or maybe not “silly,” after all, as a kid, I’ve been on several rollercoasters and rides where the restraints have had mechanical failures and I’ve had to wrap myself around the grab bars to keep from falling out of the ride. That’s gotta induce some long-term trauma or something….) 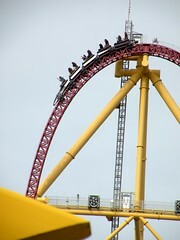 And I think about death, and how one’s view of death is typically like my view of rollercoasters. From far away, it might not look fearsome, but the larger it looms and the more proximal it is, the greater your anxiety. You try to find ways to avoid it or delay it. It’s not a ride you want to go on, but you are in line already and the wait until your turn gets shorter with every passing minute. You pray and this helps to alleviate your fears a bit. Eventually, the time comes and you put your trust in God and get on the ride. And it ends up being so much better than you could have thought and you wonder why you were afraid to begin with. Had you known at the beginning of the line what you knew at the end, you would have eagerly looked forward to the trip. And this is one of the many reasons why I know that God is alive and present in my life. I am in that line. But I am not afraid, because He has given me such grace and such peace. And while I know that I am securely fastened and safe in His hands, it’s nice to know that He allows me to cling back.